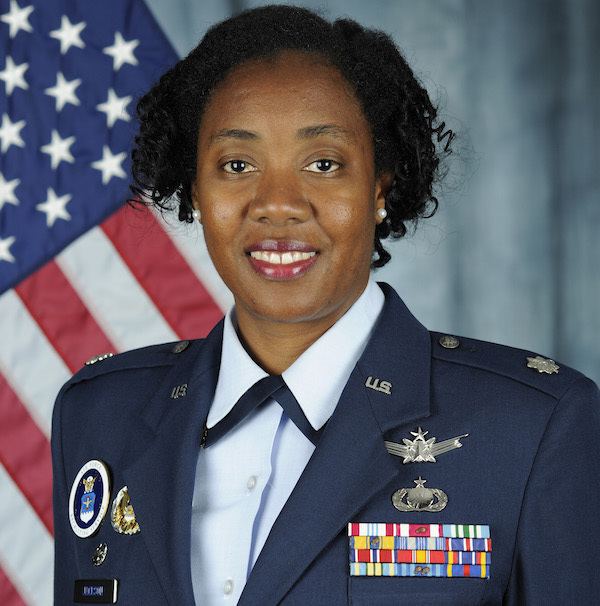 Lt Col Janelle T. H. Jackson is Commander, 317th Recruiting Squadron, Oxon Hill, Maryland. She leads approximately 86 active duty and 10 civilian personnel covering a 43,000 square-mile area that includes the District of Columbia, Maryland, Virginia, West Virginia and North Carolina. The mission of recruiting is to inspire, engage and recruit future Airmen to deliver airpower for America. In her previous assignment Lt Col Jackson served as the Deputy Chief, Advanced Development Division, Los Angeles Air Force Base, Los Angeles, California. In this capacity, she led 120 member government and contractor workforce to direct development, system engineering and logistics for the $2B future military satellite communications portfolio. She also served as the SMC HQ Section Commander where she advised 3 general officers and 26 Senior Military Leaders on the UCMJ for 1100 military personnel. She was the deputy program manager for the Enhanced Polar System where she managed development of a $1.5B joint-service SATCOM program supporting strategic users above 65 degrees North latitude. She previously served as an Air Officer Commanding at the United States Air Force Academy where she led 101 cadets and 3 noncommissioned officers. She was a subsystems engineer on the MC-130H Combat Talon II Aerial Refueling System, AFSOC’s $30M top priority modification and the flight systems technical lead for the AC-130U Gunship. She was competitively selected for the Space and Missile Acquisition Exchange Program (SAEP), where she became a space professional as the Commander of the Standardizations and Procedures Flight for the 2d Range Operations Squadron, 30th Operations Group, 30th Space Wing, Vandenberg Air Force Base, CA. She also served as the Range Operations Commander for three Intercontinental Ballistic Missile (ICBM) tests valued at over $66M. She was handpicked as the 14th Air Force Aide de Camp, Air Force Space Command. Lt Col Jackson served as the Chief, Tagging, Tracking, and Locating Branch, SIGINT Applications and Integration Office (SAIO), NRO, Chantilly VA. She wrapped up her NRO tour as a Flight Commander in the National Reconnaissance Operations Center directing a 30-person government and contractor 24×7 operations team providing system status, event notifications, and mission readiness of the multi-billion dollar satellite enterprise. She also served in a myriad of positions in the Air Force Legislative Liaison office to include Deputy Chief, Congressional Engagements Branch, Congressional Action Division; Deputy Chief, Congressional Support Branch, Congressional Inquiries Division; Liaison Officer, Senate Liaison Office; Assistant Executive Officer for the Director, Legislative Liaison; and Chief, Space and Cyber Programs, Congressional Weapons Division. Lt Col Jackson earned a Bachelor of Science in Mechanical Engineering form Virginia Polytechnic Institute & State University in Blacksburg VA.